Edox is the brand name of watches manufactured by the Era Watch Company in Switzerland. 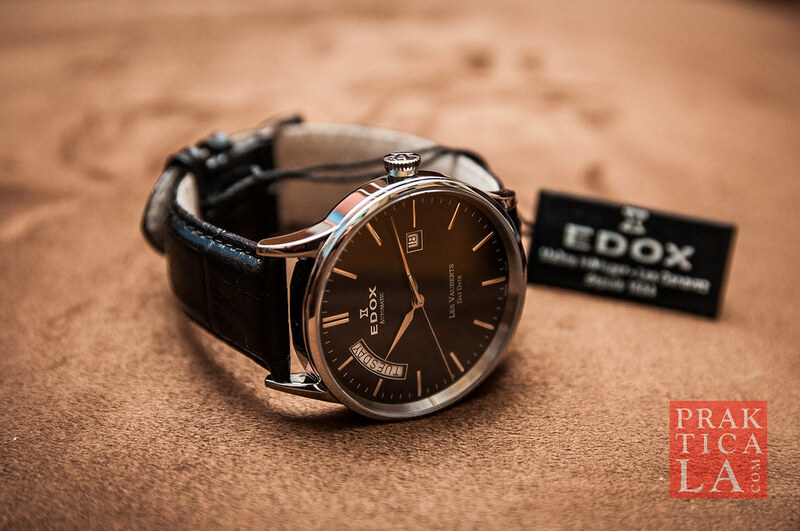 The pricing of their watches put them roughly in the same field as other entry-level Swiss brands like Hamilton, Tissot, or Raymond Weil – all of whom are well-recognized names in the United States. 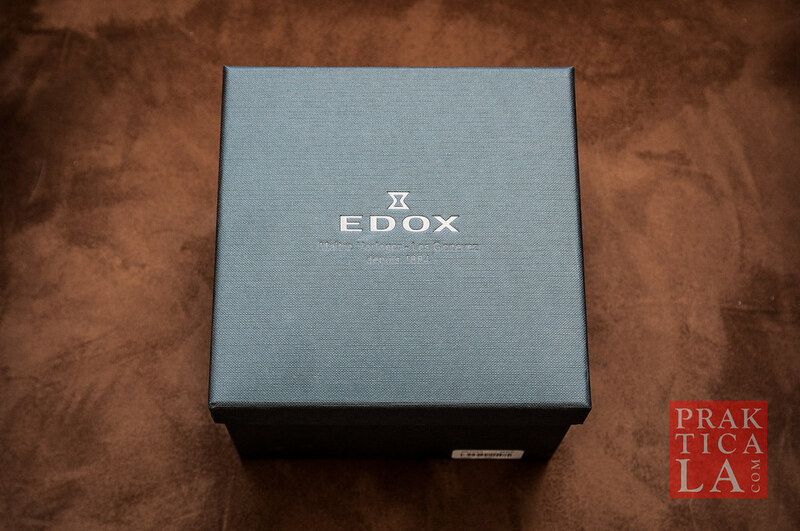 But if you travel overseas, you will find that Edox is considered a mid-level luxury watch, much more highly respected than any of those three, and only now beginning to build more momentum and awareness in the states. This makes an Edox watch a great conversation starter – it’s more than pretty enough to get attention, and not everyone will have heard of the name before. Conversely, knowledgeable watch aficionados will recognize it and you’ll have something to talk about! The Edox Les Vauberts is available for less money with a battery-operated quartz movement, but that would defeat the purpose of getting a fine Swiss watch! The automatic movement is much more refined and impressive. The case is 40mm of polished stainless steel, and the dial is clean, with bright silver hands and hour markings. The crystal is scratch-resistant sapphire. It’s a very cheerful and friendly watch face. 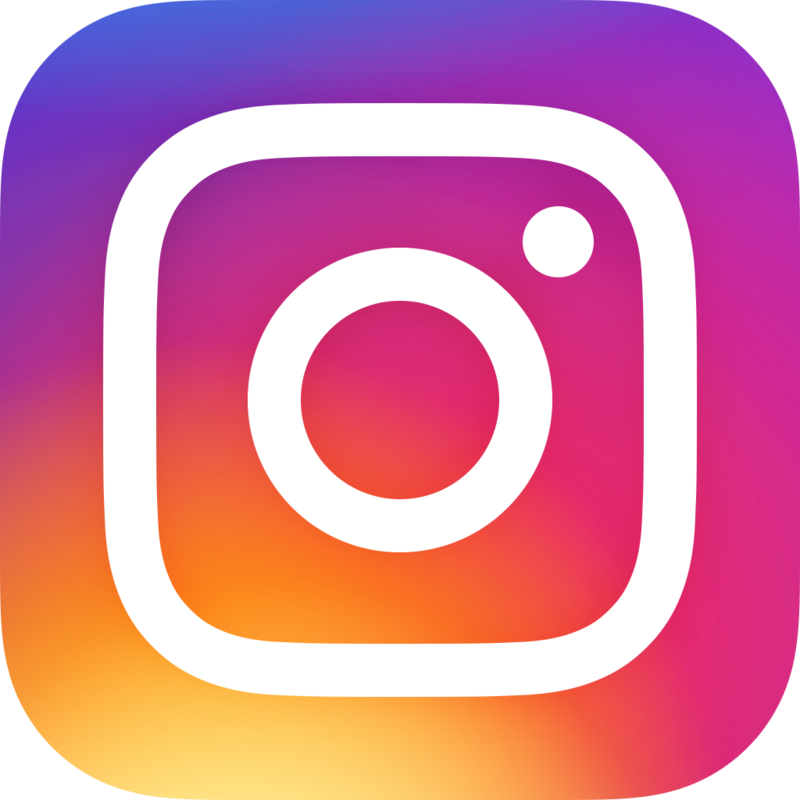 There are two separate windows for the day and date displays; these can be adjusted by pulling the crown out one stop and rotating clockwise to change the date, or counterclockwise to change the day of the week. Pulling the crown out two stops allows you to adjust the time, and pushing it in all the way lets you manually wind the movement if you wish. Of course, if you’re wearing the watch regularly, it will wind on its own through the automatic movement. The back of the watch case lets you see the inner workings of the rotors, cogs, and springs through a sapphire crystal window. Other varieties of the Les Vauberts feature a single window for date only, or nothing at all besides the time. I like this version best though; it is a good compromise between utility and formal simplicity. The strap is genuine leather with an embossed croc pattern, fastened with a single pin clasp. Par for the course. 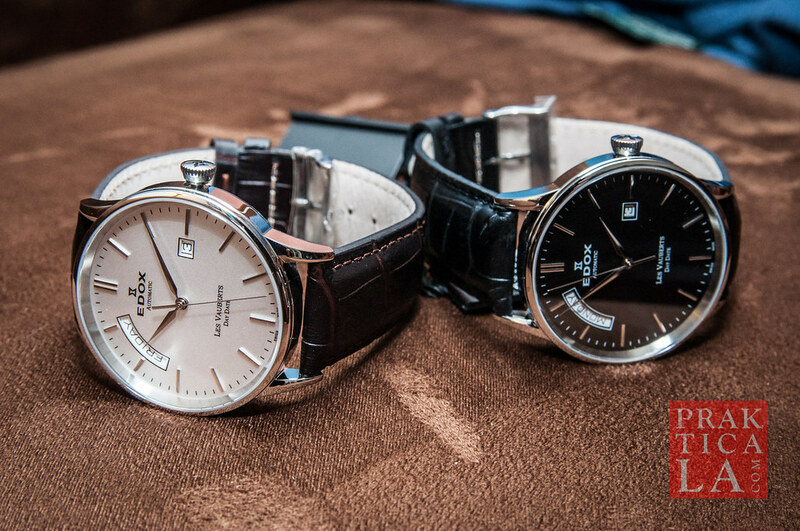 The 83007-3-AIN has a brown strap paired with a white dial, while the 83007-3-NIN has a black strap with a black dial. 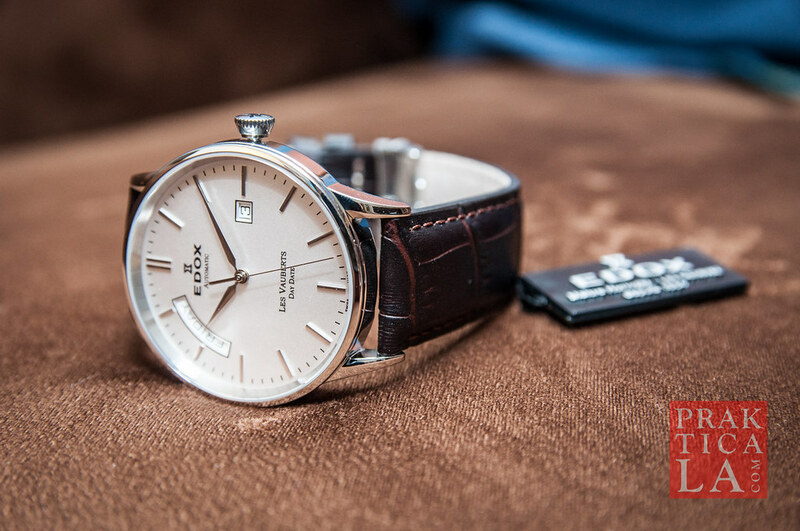 I prefer the brown/white combination simply because it is more versatile as well as brighter looking, but some people may prefer the mystique of a darker watch. The Edox Les Vauberts is lighter and slightly lower profile than comparably-sized automatics. This is a trait that Edox is known for. 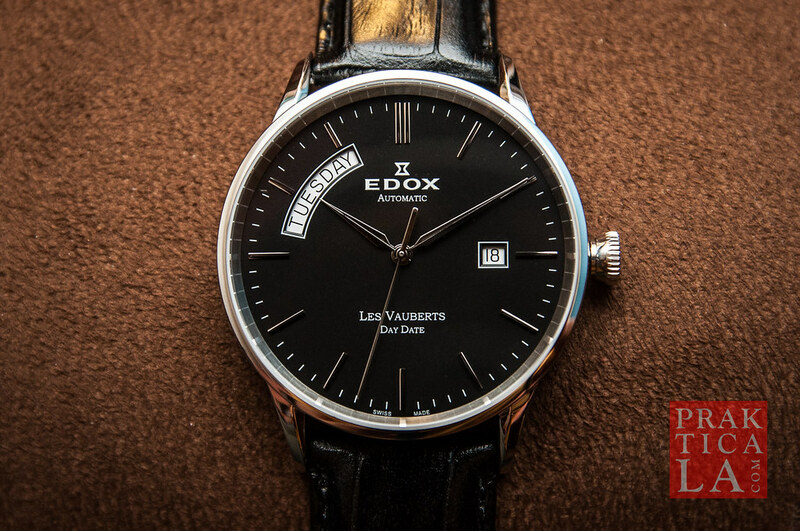 Some (including me) like the mass and heft of an automatic watch that makes it feel substantial, but the Les Vauberts’ lightweight build makes it less of a burden to swing around for a long day of handshaking and meet-and-greeting. Besides that, the construction of the watch is visually impeccable. I did encounter some issues with the movement; after a period of disuse (a few weeks), the rotor got “stuck” so that hand-winding the crown took a great deal of effort and would spin the wheel inside, which it shouldn’t do. 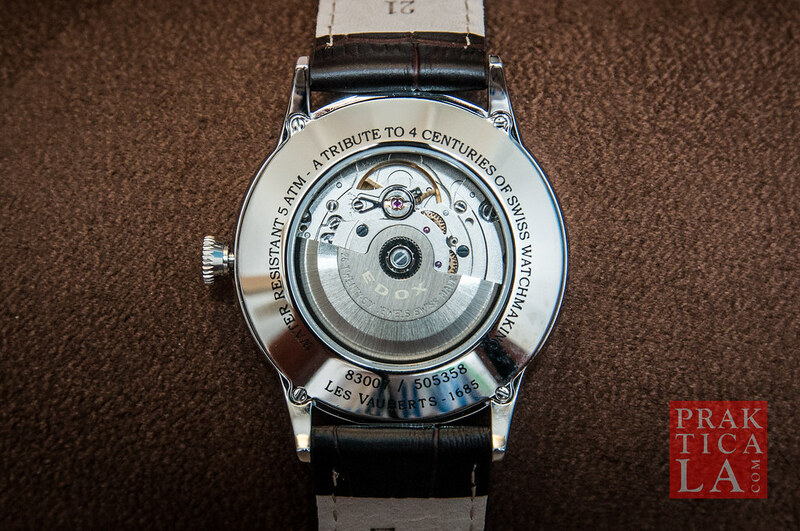 I expect the lubricant inside the watch stiffened through stasis and prevented the rotor from spinning freely. It was an easy fix, but I did encounter this issue on both watches pictured here, which makes me think that perhaps Edox uses a lubricant that gums up easily. Not a huge deal, but it is an annoyance worth noting, since it requires the watch to be serviced. The preventative solution is to keep the watch wound regularly, either by frequent wear or by manually winding the crown when not in use. Since Edox is still relatively little known in the states, you can pay around the same for an Edox watch as a Hamilton or Tissot, but get a higher-end product. This is an incredibly sharp-looking watch. In terms of formality it is along the same lines as the Tissot Le Locle (see my review here), depending on which color you choose. As I mentioned earlier, I prefer the brown/white combo for its brightness and versatility. Overall, the Edox Les Vauberts is a great value as far as Swiss autos go. You will be hard pressed to find more watch for your money outside of Japanese brands like Seiko or Citizen (both also fantastic). Grab the brown/white Les Vauberts (83007-3-AIN) here, or the black/black version (83007-3-NIN) here. 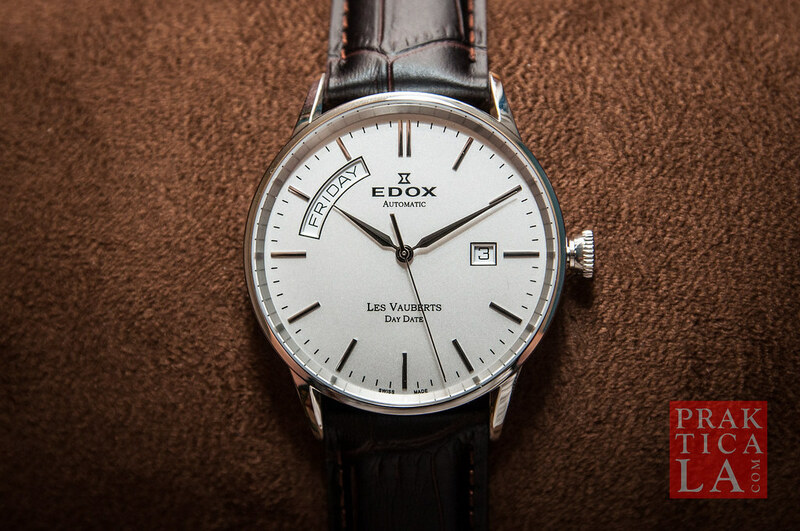 Have you tried on an Edox Les Vauberts Swiss automatic watch? What do you think? Let us know in the comments below! Looks very nice, but won’t be purchasing if BOTH watches basically failed on you.